A wedding on a lake house in Connecticut where the bride and groom are entering the cocktail hour on a motorboat? And I’m there to capture it all on Super 8? Count me in. Plus, Brittany and Alex were such a fun and chill couple and their family and friends were a blast. And to top it off, their photographer, Dan Crosley, would be photographing the whole thing on film as well. A 100% film wedding! So rad! Take a peek at their Super 8mm wedding film below as well as some of the instant photos I took. As much as I love New York City, any New Yorker will admit to wanting to get out of the city for a break and soak in some nature. So getting to capture a wedding at a family lake house with the ceremony taking place right on the water was absolutely amazing. Right after their ceremony on the waterfront, the couple hopped on a bona fide yellow school bus and jetted over to the other side of the lake for some portraits. This all leading up to some friends in a motorboat arriving to pick them up at sunset and shuttling them across the lake to the all of the wedding guests eagerly waiting for them to arrive. It was pretty fantastic. Then the fun just kept going with their dancing-filled reception and some hysterical toasts. What an evening and so happy for them as they start life together! Last winter, I got to shoot another very special wedding to me, my own sister! I actually shot both Super 8 and digital (Alarming I know!) during the wedding which took place on the beaches of Key West, Florida! You can see their wedding film below! Packing light as I had just come from a trip to Argentina, I arrived with my wife and just a small backpack. But given that it’s on a beach, tons of clothing isn’t really necessary. This was a small, intimate ceremony with just close family and friends on the beach and officiated by our dad. Given the casual nature of the wedding, it was easy and fun to roam around with my sister and her future husband and capture the day. I shot the Super 8 wedding film and the digital photos as a gift to my wonderful and sometimes feisty sister. I love her and was happy to help in any way I could to make her wedding day special. Enjoy the film and the rare occasion for me to post digital photos here! Jessica and Jeremy are a special one for me... mainly because they are related to me! Jessica is my sister-in-law and now Jeremy will be my brother-in-law. I was a guest at this wedding but as any photographer knows, it's hard to resist taking some photos and Jessica had actually reached out beforehand asking if I didn't mind taking a few. Uh... Yes! This was a bit of a trip for me since this is only the second time I've ever been to the west coast! Last time I was out there was when I got engaged! But anyways! The wedding took place in Camarillo about an hour north of LA, where they have been living, on a beautiful avocado/blueberry farm called Gerry Ranch. I must say farm weddings on the west coast are just about everything a film photographer could ask for. Great light. Great landscape. Obviously fantastic weather! I'm in. This time it's a mini wedding film as I was a seated guest doing my best to behave. Also it's actually an excerpt out of the 2 rolls of Super 8 I shot during the road trip my wife and I did while in the LA area. One day I'll get that up on the blog! You can see Jess's mini film below! Overall, a really fun wedding with family and I was more than thrilled to capture a few moments of it on film. This is a wedding I had long been looking forward to shooting, Aileen and Philip! 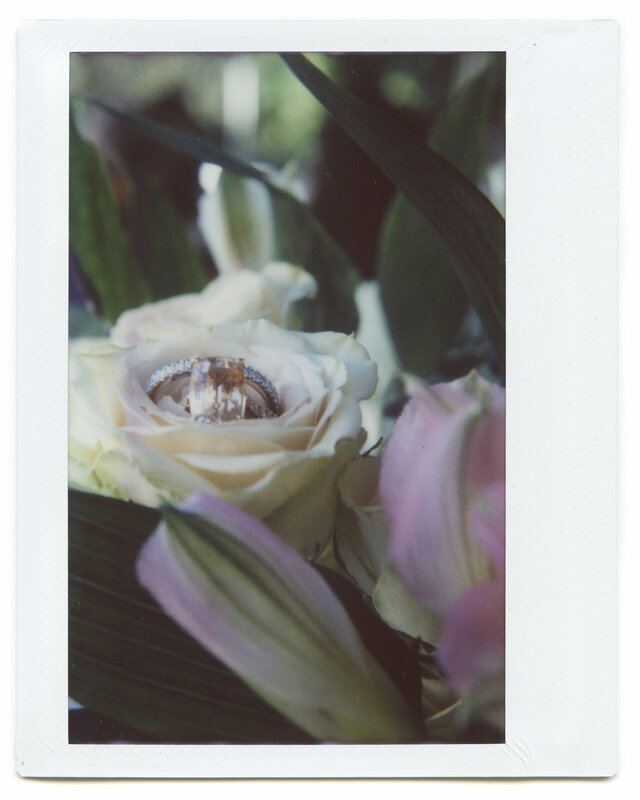 Aileen had contacted me over a year before her wedding raving about instant film and loving the Super 8 look for weddings so it was easy to be excited to shoot a wedding when the bride is so excited as well. You can watch their Super 8 wedding film below. This wedding was a bit unique as well in that there were actually to be two weddings: a smaller family and bridal party wedding on Saturday (which is what I shot) and then a larger more traditional wedding on Sunday (shot by a friend and awesome photographer, Sophie Kwalek and featured on Style Me Pretty. Sophie and I both worked together on Patrick and Rachel's gorgeous Prospect Park Boathouse wedding). This was also unique in that I'd be the only photographer or cinematographer for the day, shooting everything on Instax and Super 8 film. So we started the day at a beautiful cathedral in New Brunswick where the ceremony was held. A few guests and the families were the attendees for this more intimate ceremony. Aileen was wearing a stunning, fitted white dress and Philip was in a fantastic blue suit with red velvet accents. Very stylin’. After the ceremony we strolled around the Rutgers campus where the couple met to take a few photos before headed over to the lunch held at one of their parent’s homes. There, they changed into outfits for a traditional tea ceremony held after weddings with close family. Then another quick outfit change into more comfy clothes for a veritable feast that awaited everyone in the backyard, cooked by the parents and included endless lobster, corn, meats, and veggies. A really lovely and laid back wedding day for two really great people. I had a lot of fun shooting with them and really love how their wedding film came out.